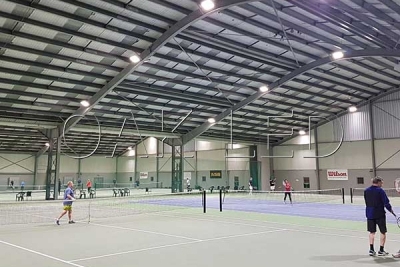 Indoor tennis court project in New Zealand. 540W reach 1500lux. Quality of light is critical for indoor sports facilities. OAK Lighting Solutions flood lights feature a rugged design with high quality light, which makes them perfect for athletic applications, including gymnasiums, ice rinks and soccer fields. A brief power outage for a facility with metal halide lighting can delay a game up to 15 minutes before the metal halide lights can turn back on. The instant-on feature of LED lighting brings the light back right away.